If you love waking up to the smell of freshly baked bread in the morning, then the Sunbeam 5891 2-Pound Programmable Breadmaker is for you. Add this to the smell of freshly brewed coffee and all your senses will be positive and ready for the busy day ahead. The Sunbeam 5891 is a light bread machine that has a simple and elegant design. The white machine has a large menu and LCD screen on the front and a lid that opens at the top. The Sunbeam Bread maker powers a 600-watt oven that allows you to bake different types of bread. With the bread machine, you can make traditional 1½ or 2 pound loaves, French sticks, cakes and more goods. However, we found the machine struggles a bit to make the 2-pound loaf and moves around. Its removable nonstick baking bread pan is rectangular, but a little shorter than the traditional loaf on the horizontal. The bread maker has an express baking function that enables you to prepare a loaf of bread faster. 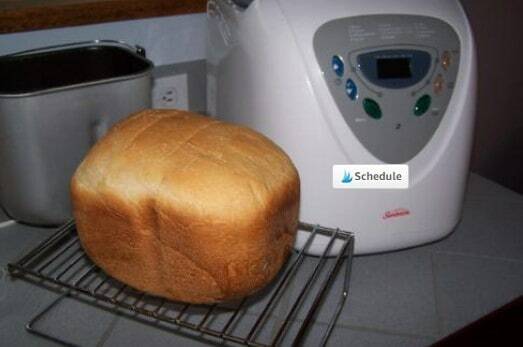 If you want to prepare your bread for delayed baking, you can program the appliance to delay for up to 13 hours in advance. There is also a detachable single kneading blade in the center. You can bake crusty or soft crust loaves with the Sunbeam 5891. You can also choose the shade of crust to be light, medium or dark. The machine’s Control Panel memory has a number of preset programs. The baking pan is non-stick and should be cleaned by hand. It is important not to scratch the non-stick surface with metal objects when cleaning the baking pan. A handy user guide and recipe book are included to help you get started with this bread maker. 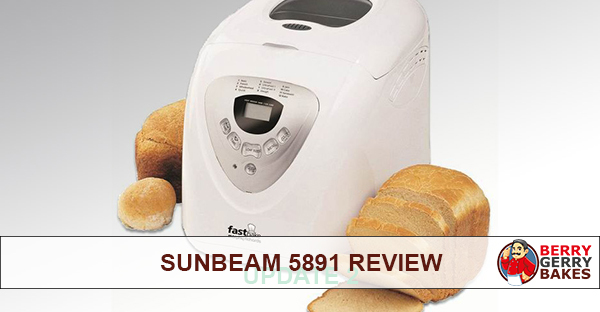 Sunbeam Bread Maker is an excellent appliance in terms of performance and price. The machine can bake a 2-pound bread and has enviable features such as a jam adding function and an audible beep that will alert you when it’s time to add raisins or dried fruit in your machine. There are 12 pre-set programs to choose from, including Bake Only for cakes and Knead Only for dough, which make the bread maker a 3-in-1 device. Other pre-set programs include Basic, Express (1.5 pound or 2 pound), Sweet, Quick, Whole Wheat, French and Basic. You can pre-program the machine up to 13 hours in advance. This means you can prepare breakfast bread the night before. Alternatively, you can prepare your evening meal bread before you leave for work in the morning. The bread machine has a large viewing window at the top, where you can monitor the baking process. 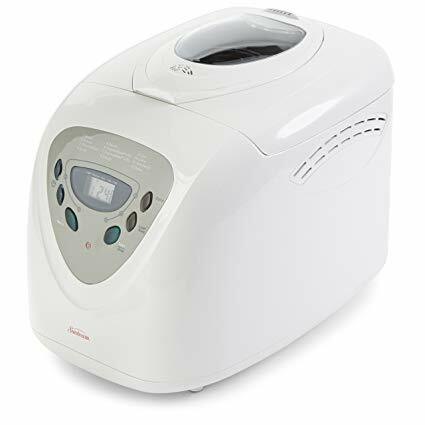 You can find out more about this appliance by reading Sunbeam 5891 bread maker reviews on Amazon. The Sunbeam 5891 comes with a recipe book with dozens of recipes for you to get started with. However, some of the recipes are not correct, especially when it comes to the number of ingredients you need to use. You can complement the recipe book with other bread recipes you come across. We recommend the “Bread Machine Cookbook” by Beth Bensperger. 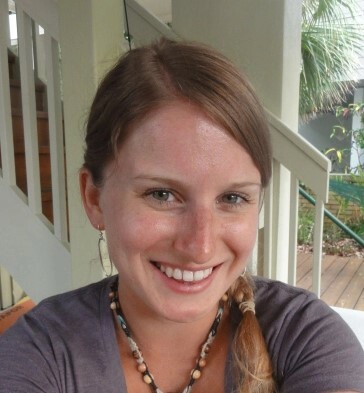 In the book, there are three recipes by Lisa Brugellis of Welbilt of America. The Sunbeam Bread Maker will produce awesome cakes and bread if you follow the baking instructions to the latter. You can use the Sunbeam 5891 to make gluten-free bread using recipes online. This bread is denser and heavier but tastes really good. Here is a video of the Sunbeam 5891 used to make gluten free bread. While the Sunbeam 5891 does not have a special gluten free setting like Welbilt Millennium bread machine models, you can use the Whole Wheat setting to make your bread. The bread maker runs quietly when kneading the dough. The handy beep informing you to add dried fruit or raisins is a baking saver. You should remove the baked bread from the baking pan when you hear the beep alerting you that the goods are ready. Otherwise, the bread may dry out and become hard. The Sunbeam 5891 makes the bread making process quite straight forward and methodical. Even if you are a beginner, you will bake excellent bread with this appliance. However, use the correct amounts of ingredients to get quality bread. Cleaning the Sunbeam bread machine is easy. Start by cleaning the baking pan. Check to ensure that no lubricating oil has leaked into the baking chamber from the blades. Otherwise, your subsequent bread will end up with streaks of oil. Sunbeam 5891 bread pan is sold at an affordable price considering it has the features that would normally find in more expensive models. Follow the cleaning instructions carefully to avoid damaging your Sunbeam 5891 2-Pound Programmable Bread maker. While the Sunbeam 5891 does not have all the bells and whistles that the best bread machines have, it makes tasty loaves of bread, including specialty loaves. This is a great machine if you have a small budget.